Do you get tired of listening same windows startup and shutdown sound?? If yes, then this trick is for you. 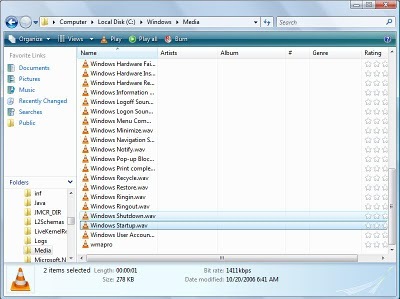 By using this you can change default windows startup and shutdown sound and can use any of your favorite voice or music as your system's shutdown and start up. Here are steps for this. 1). Choose the track or sound which you want to set as start-up and shutdown sound, But remember that file should be in .WAV formatand size of file should not be large it should be smaller than 1 mb otherwise startup will take longer time. If your file is not in .WAV format then you can easily convert it into .WAV by using jet audio or any other converter. 2). Rename these files as Windows Startup.WAV and Windows Shutdown.WAV respectively. 3). Now Go to C:\WINDOWS\MEDIA, here you will find file Windows Startup.WAV and Windows Shutdown.WAV, move them to some other locations, So tht you can set default sound again in future. 4). Now move files which you have choosen to C:\WINDOWS\MEDIA.